Why would you need vinyl pool liner repair or replacement? Your vinyl pool liner can come out of the track-vinyl pool liners are meant to fit exactly into the shape of your pool. While this means they offer a tight bond to the pool edges, it also means that they must be installed perfectly – anything slightly too big or too small can cause the bead to pop out of the track. Moving your pool liner back into place after it has popped out can be a lot of work – it basically involves heating the liner and physically stretching it and forcing it back to where it belongs. 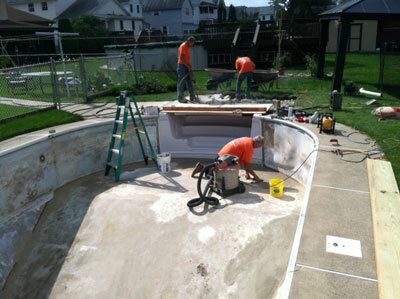 Fortunately, this is no problem for Bel-Air’s vinyl pool liner repair experts! If you need your vinyl pool liner put back in place, call us today! Your vinyl pool liner can start to fade – due to the chemicals in the pool and the constant exposure to sunlight, your vinyl pool cover can start to lose its color, especially if you have an older pool liner. 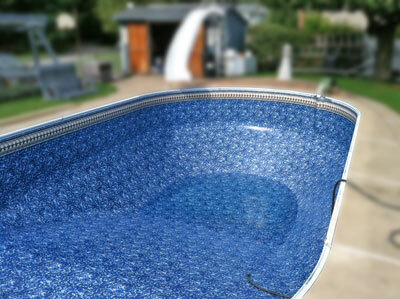 If your pool liner is starting to fade or develop cracks, give us a call. We can figure out the source of your problem (usually overuse of harsh chemicals) and make recommendations as to whether you need vinyl pool liner repair or if you should just replace your vinyl pool liner. Your vinyl pool liner can start to leak – vinyl pool liner leaks are not uncommon, especially as your pool liners get older. Basically, if you have to add more than one inch of water to your pool per week (discounting splash-out and wasted water from backwashing) you know you have a leak. If you find that this is the case, call us at Bel-Air. We can find the leak in your vinyl pool liner and repair it quickly so you can get back to enjoying your swimming pool as soon as possible. Bel Air can assess your problem and take care of it quickly so your vinyl pool liner repair or replacement needs can be as hassle free as possible. Please feel free to contact us anytime for all of your pools needs.